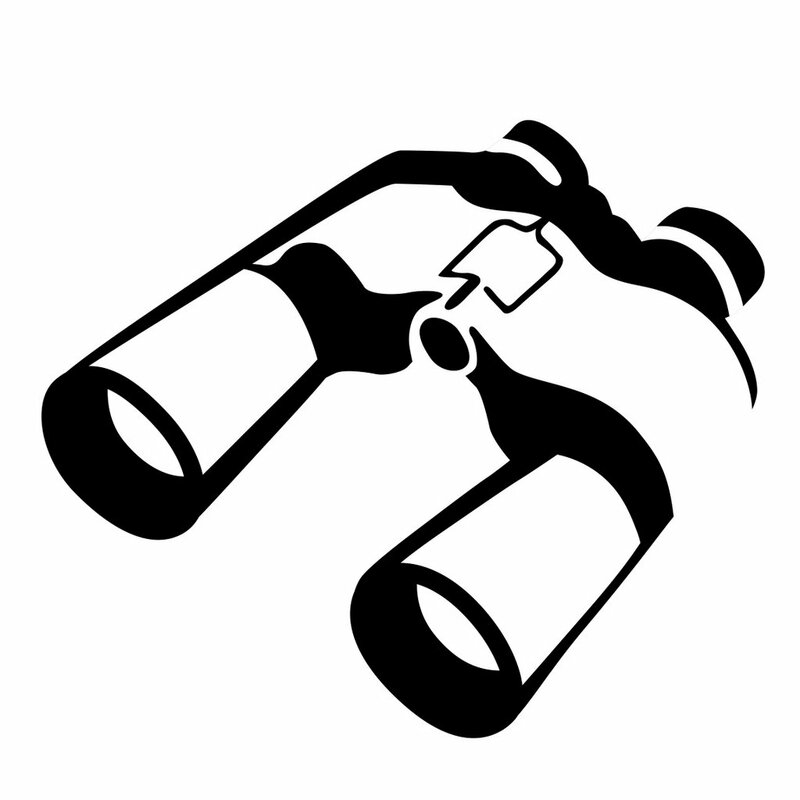 February Observations: If It Sounds Like Print and Looks Like Print, Is It Printing? 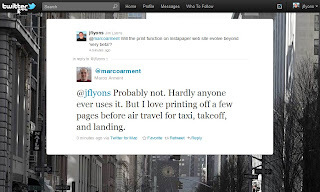 Observations: If It Sounds Like Print and Looks Like Print, Is It Printing? [February 24, 2011] Since my November 2010 Observations column on ACTPrinter (“All That Glitters...”) and January 2011 Observations column on paper.li (“Paper as a Metaphor”), I have been tempted to fall back on the old saw, “If it looks like a duck, quacks like a duck...” and conclude that these products confirm the importance of printing in our new world, but this is not the case! In fact, these two solutions with print or paper in their names do not actually mean paper or printing in any material sense at all. 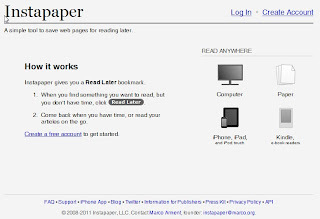 In the same vein, I offer the conclusion of my three-part series with this month’s feature attraction, Instapaper, the very popular viewing app for iPhone/iPad/iPod Touch (Apple iOS) and other platforms, including Web browsers and Amazon Kindles. At first glance, this popular app (featured in much press coverage, including The Wall Street Journal and the New York Times) with the prominent inclusion of the word “paper” in its name, makes a long-time printer industry member like me take quick notice. But while the $5 version (a free one is also available), named by the Times’ Damon Darlin as “One of the best values in the Apple App Store” in December 2010 and by fellow Times writer Bob Tedeschi as one of “Ten Apps That Make Magic on Your iPad,” also in December, meets user needs in virtually the same fashion as physically printing and then reading the content, Instapaper precludes the trip to the printer and the corresponding depletion of paper and toner or ink. The description of Instapaper available from the app’s listing on the Apple iTunes App Store has a familiar ring to it: “Great for long articles and blog posts that you find during the day and would like to read, but don’t have the time when you find them. 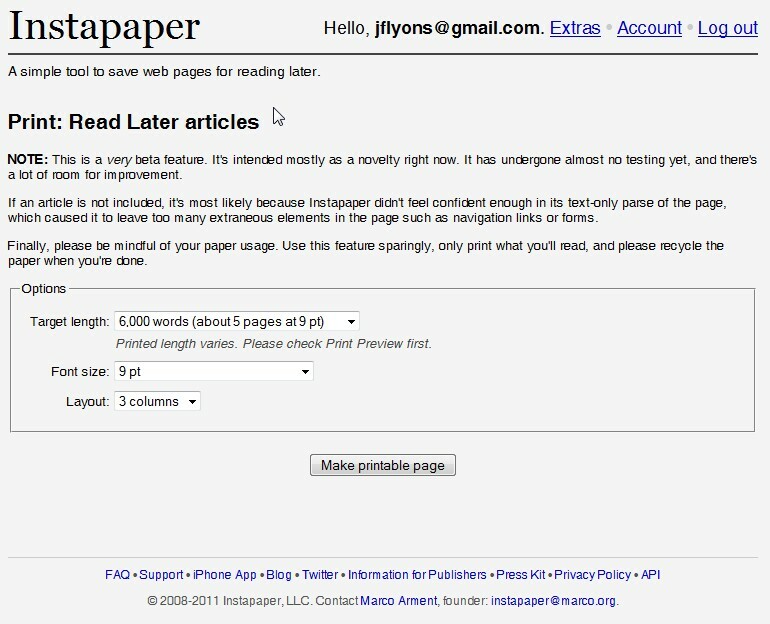 Save with Instapaper, then read later, when you’re commuting, in a meeting, or waiting in line.” This description could have just as easily been ascribed to HP’s original Web Printsmart or Canon’s WebRecord (and was, just not in so many words), back in the days when information availability was exploding via the Web and e-mail, and printer industry types were assured that content must be printed on paper before being consumed, at least in a large number of cases. 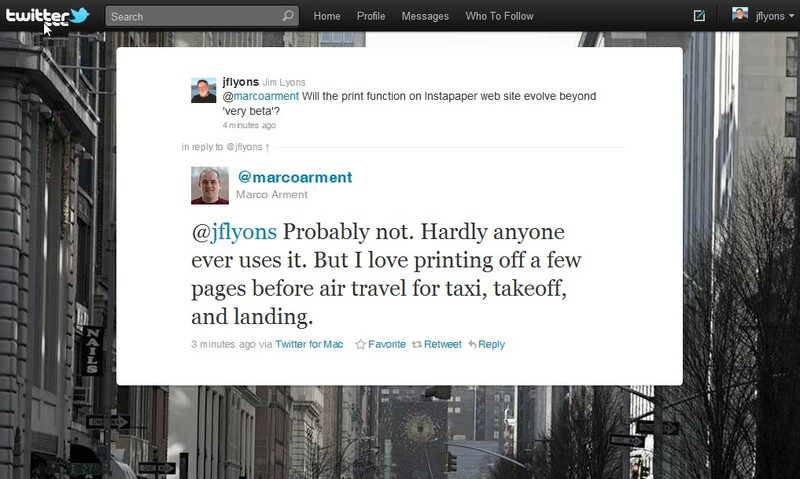 Apparently, in the decade or more since those first Web-printing attempts (see “Printing from the Web – Are we reaching the end point?”), the physical act of printing has more often been replaced by the virtual equivalent. 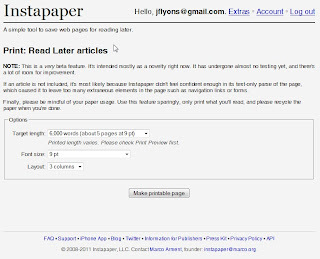 The Instapaper App Store description of the application’s core features also states, “Saves most webpages as text only, stripping away the full-sized layout to optimize for the iPhone and iPad screens; distraction-free reading environment gets out of your way so you can focus on the content; everything you download is then available off-line so you can read whatever you want even on airplanes or on Wi-Fi only devices away from Internet connections.” Substitute “letter-sized and A4 paper” for “iPhone and iPad screens” in that feature list and you would have a description of the Web-tuned printing apps of recent history. So just as the electronic viewing of photos has become more customary, via social media platforms like Facebook, photo sites like Flickr, and even digital photo frames, electronic document viewing continues its march toward popularity and pervasiveness. These “substitutes,” as economists label them, are replacing printed photos and documents, leaving our industry with the hope that net growth in prints coming from the total number of photos taken and documents distributed increases faster than the decline in printed content. 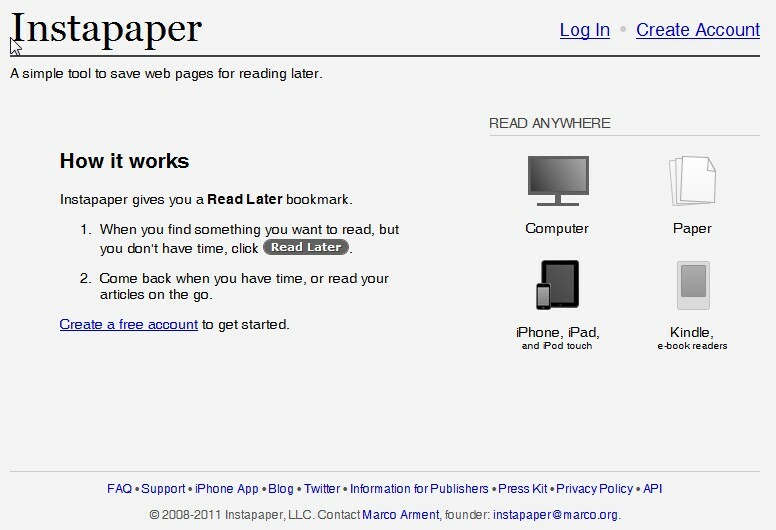 But, a “print” option displayed to logged-in users on Instapaper’s Web site (and described pre-login, see screenshots below) offers a glimmer of hope. This twitter exchange just goes to show that like the “everything will be printed” assumptions of a more than a decade ago, today’s “nothing will be printed” assertions will not come to pass—the world does not work like that. Finding the right time, place, and applications for each medium is the important issue that will let creative forces prevail in our industry and others. First of, my print-related excerpts of the analysts conference call transcript, available at Investor Relations at HP.com. And then the inclusion of my customary updated metrics table. [Regarding consumer businesses,] The enthusiasm and anticipation for webOS exceeded even our most optimistic expectations. We look forward to providing a differentiated seamless experience across our tablets, smartphones, printers, PCs, and future form factors. [As far as top line revenue,] We continued to see good performance in our commercial hardware businesses, led by strength in converged infrastructure and commercial printers and PCs. We posted solid double-digit revenue growth across these businesses, with Enterprise Servers, Storage and Networking growing 22%, and commercial printer hardware and PSG commercial revenue increasing 13% and 11%, respectively. 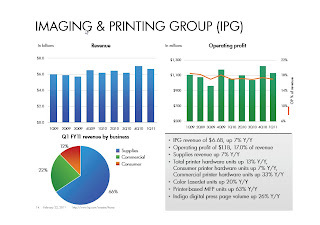 The Imaging and Printing business delivered strong performance in the first quarter with revenue growth of 7% to $6.6 billion, led by commercial revenue growth of 13% and supplies growth of 7%. Segment operating profit totaled $1.1 billion, or 17% of revenue. Total printer unit shipments increased 13% with commercial and consumer printer units up 33% and 7%, respectively, as we gained market share across all printing categories with particular strength in higher usage segments. We continue to see solid momentum in our growth initiatives and to lead the market with innovative new products. Our graphic arts business grew double- digits and we are pleased with the momentum in our web press business. Our color laser and multi-function printer units grew 20% and 63%, respectively, while business inkjet unit shipments increased double- digits from the prior year and shipments of wireless printer units more than doubled. In addition, we shipped more than 3 million web-connected printers in the quarter. We will continue to target these markets aggressively, leveraging our technology leadership to drive the shift from analog to digital printing. Rakers: Yes, thanks, guys. I apologize, I'm going to go back to actually Keith's question earlier. So just to be clear, Cathie, you talked about low single digit growth now in the Services business. I think at the Analyst Day you talked about 2% to 4%. If I do the backwards math, that would be about $700 million, $750 million in revenue shortfall. That leaves you about $1 billion left spread across the segments. I guess my question is, are you still confirming your 7% to 9% growth expectation in Enterprise, Server, Storage and Networking as well as the 3% to 4% growth target for the Imaging and Printing segment for fiscal 2011? Thank you. Lesjak: So, Aaron, on earnings calls, we don't typically update our guidance relative to the segments. I've laid out for you, or we've laid out for you, the guidance for Q2 and a full fiscal year from a revenue perspective. I don't have anything more to add to that. Apotheker: So this is -- let me just wrap this call up by sharing with you some final thoughts. HP delivered strong margins, earnings and cash flow performance in the quarter and our operational discipline is intact. We continue to show strength in our core markets. We're winning in the data center, we're capturing the share of the printed pages moving from analog to digital and we're well positioned as the world of cloud and connectivity converge. As we discussed, we have some work to do in a couple of areas and I'm confident in our ability to execute our plan. I look forward to sharing more of our strategy with you at our March 14 Summit. HP announced their numbers tonight after the closing bell, and while a mixed picture by most accounts, the stock immediately sold off double-digit percentages, wiping out the gains since the first of the year. 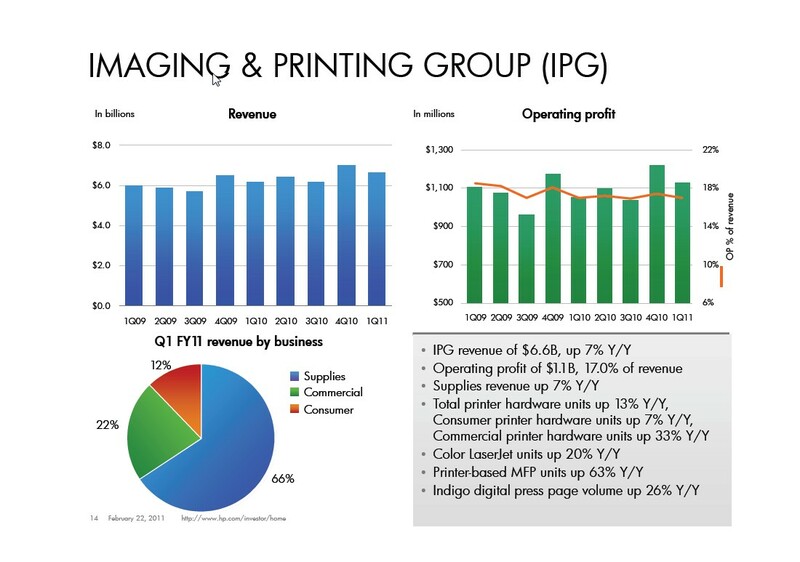 I will have a closer look at some of the printing-related comments and numbers here, tomorrow, but for now take a look at the IPG slide - with all the muss and fuss about the economy, drop-off in printing, etc., it's interesting to me that it's a relatively placid-looking big-picture view.